Tex Mex Egg Rolls are a delicious appetizer or meal. Filled with beef, cheese and chili spices, these rolls are a winner. Can you believe it is September already?! That means football season is here! One of our favorite fall activities is hanging out watching the games. We love getting together with family and friends and enjoying game day food while our favorite team is playing. These Tex Mex egg rolls are a great appetizer to make for game day, a party or even dinner. The crunchy, golden wrapper filled with a cheesy beef mixture is always a hit. 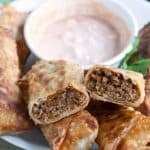 I like to serve the egg rolls with a dip made from salsa and sour cream. They are great dipped in guacamole too!! If you have a lot of people coming over, this recipe can be doubled. 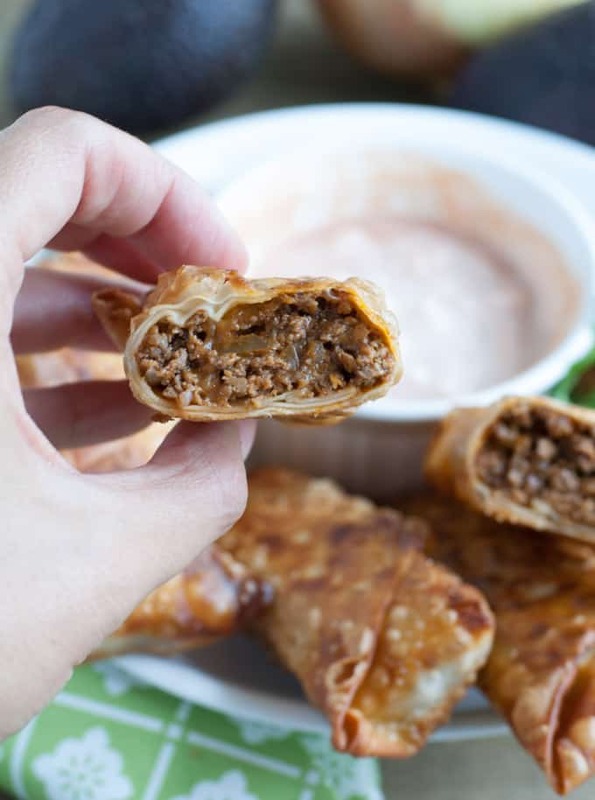 Start making these egg rolls by browning the ground beef. Once cooked through, drain grease and stir in onion. Add cheese, chili seasonings and salsa, stir until combined. I use the chili seasoning that comes in an envelope package. My grocery store keeps them by the gravy packs. Not the chili spice bottle found with the spices. Place 3-4 tablespoons of the mixture in the middle of each egg roll wrapper and roll. Place them in hot oil to fry and then drain on a paper towel. They need about 4-5 minutes per side or until golden brown. I hope you enjoy these Tex Mex egg rolls. What are some of your favorite game time snacks? Looking for more game day snacks? Brown beef in a large skillet over medium heat. When no longer pink, drain excess grease. Add in diced onion and cook for another 2-3 minutes. Remove from heat and add cheese, chili seasoning and salsa. Place 3-4 tablespoons of mixture in the center of egg roll wrapper. Fold bottom corner up over the mixture. Fold in sides towards the middle and then finish rolling. Seal with water. In a deep skillet, heat oil to 375 degrees F. Place 2-3 egg rolls in the hot oil and fry 2-3 minutes on each side. Drain on paper towels. For the sauce, stir together sour cream and salsa. Also good served with guacamole.